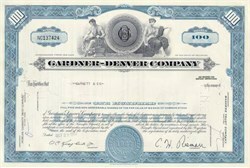 Beautifully engraved Stock Certificate from the Gardner - Denver Company issued between 1960 - 1972. These historic documents have an ornate border around it with a vignette of two allegorical figures. This item has the printed signature of the company's president and is over 33 years old. Gardner Denver is considered an international leader in providing compressed air and petroleum equipment that help keep thousands of manufacturing processes, as well as oil and gas production, moving ahead at a brisk pace. 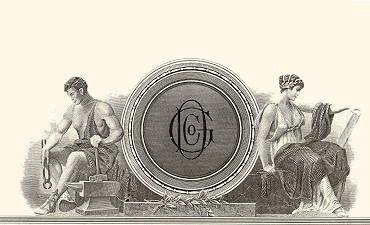 They have long-standing relationships with many of the world's leading manufacturers of consumer and industrial products. There goal is to create innovative compressed air, petroleum pump, and natural gas compressor solutions that help facilitate the free flow of products from manufacturers to their respective end users in North America and around the world. They also deliver custom-designed equipment packages which often provide their customers with the competitive edge that defines the difference between moderate and superior results in the marketplace.